Are you ready to update the form and function of your bathroom design to the 21st century? When you install an Adelaide High Efficiency Toilet (HET) in your bath, you'll be making an investment in improving the style of your bathroom design, as well as making a decision that will benefit the environment and help you save money on your utility bills. Made by Caroma, Australia's largest plumbing fixture manufacturer, the Adelaide HET is a stylish and practical addition to any bathroom design. The Adelaide has earned the prestigious WaterSense stamp of approval from the Environmental Protection Agency (EPA), so you can be confident that it truly is an environmentally friendly bathroom fixture solution that can help reduce your water consumption expenses. The toilet has a pair of chrome buttons on the tank that allow users to control the volume of water used per flush. One button releases a half flush of 0.8 of a gallon, while the other is a full 1.6 gallon flush. You can coordinate all the fixtures in your bathroom by selecting from among the range of stylish sink and toilet fixtures that make up the Adelaide product line. You can choose a variety of different types of sinks, including above counter, wall mounted, and inset options. You can even get an Easy Height Adelaide sink that is fully compliant with Americans with Disabilities Act (ADA) standards. 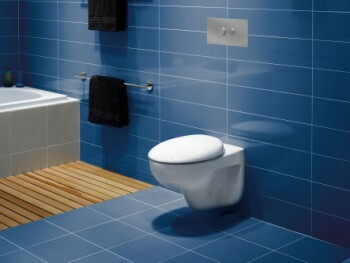 You can choose between the Round Front Plus and Easy Height Round Front Plus toilet designs. Caroma products can be found at plumbing and green building supply dealers, as well as in numerous kitchen and bath showrooms around the world. For more information on the Adelaide HET or other Caroma products, visit www.caromausa.com or call toll free 800-605-4248.